Mouth guards are customized devices worn over the teeth to protect them from injury. Unlike dental splints, which are orthodontic devices used to treat conditions such as teeth-grinding (bruxism), snoring or sleep apnea, mouth guards are used primarily to protect the teeth and braces during athletic or recreational activities. Effective mouth guards should be comfortable, durable, easy to clean, and allow the wearer to breathe and speak normally. Any individual, child or adult, who engages in contact sports, such as football, hockey, boxing or lacrosse, or participates in any activity in which the mouth is vulnerable to injury, such as bicycling or skateboarding, is advised to wear a mouth guard. The reason for wearing a mouth guard during such activities is to diminish the risk to the teeth, tongue, jaw, gums, and nerves of the area. Without a mouth guard, anyone who is physically active runs increased risk of chipping, breaking or losing a tooth, injuring the soft tissue of the mouth, and damaging or even fracturing the jaw. Mouth guards are especially helpful in protecting dental or orthodontic appliances. Braces and fixed bridge work can be damaged during sports encounters and require expensive repair or replacement. Even worse, a setback in treatment can occur as injuries heal and equipment is repaired or refitted. Although it may seem contradictory, patients are advised to remove orthodontic retainers or headgear during sports. While over-the-counter mouth guards are available, they are no substitute for individually designed, custom-made mouth guards manufactured in a dental office or professional laboratory. Personalized mouth guards, produced to protect the patient’s particular bite, though more expensive than those that are mass-produced, are well worth the extra cost. Because they fit the patient precisely, they leave less room for damage to teeth or hardware, and provide greater patient comfort. Also, because they have been specially prepared for the individual, they are unobtrusive during speech and never interfere with normal breathing. There are several steps involved in the manufacture of a custom-made mouth guard. First, the dentist uses a malleable material to make an impression of the patient’s teeth. Then a mouth guard is molded over the impression. 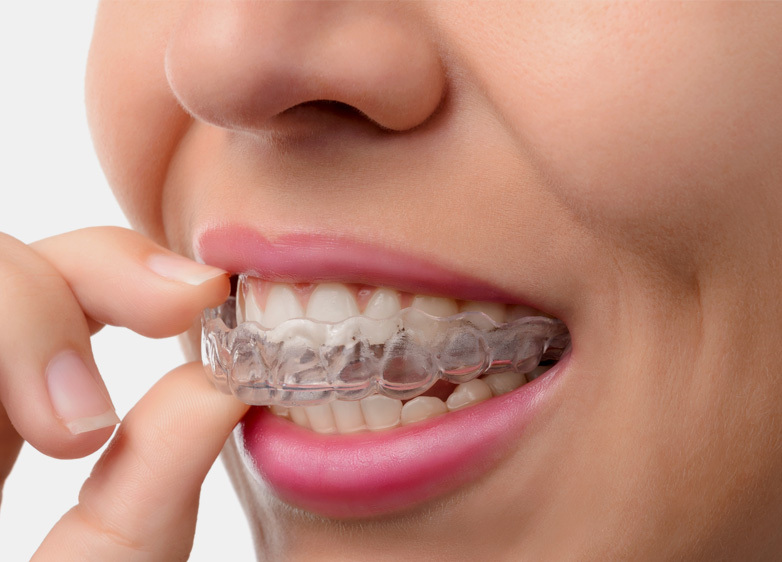 In most cases, mouth guards cover only the upper teeth, but, when necessary, particularly when the patient wears braces or other dental appliances on the lower jaw, a mouth guard will be fashioned for the lower teeth as well. Mouth guards, like other dental equipment, should be cared for properly to increase their longevity. Patients should always rinse their mouth guards with mouthwash or cold water and clean them with a toothbrush and toothpaste before and after each use. The devices should also be washed on occasion in cool soapy water, rinsed and dried thoroughly. Mouth guards should be stored in containers with air holes to permit circulation and should be kept away from heat. The mouth guard should periodically be examined for wear and should be brought to all regular dental visits so that it can be evaluated to see if replacement is necessary.